Figure 1: Relationship angles of Haglund's deformity. 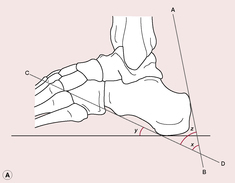 x, superior calcaneal tuberosity angle; y, calcaneal inclination angle; z, total angle of Ruch. This article was published in Neale's Disorders of the Foot, Lorimer, French, O'Donnell, Burrow, Wall, Copyright Elsevier, (2006). Caption: Figure 5 Technique for measuring calcaneal inclination angle (CIA) and lateral talocalcaneal angle (LTCA) on x-ray.